Xavier van Wersch obtained a degree in Sonology at the Royal Conservatory in The Hague after having studied art and philosophy. 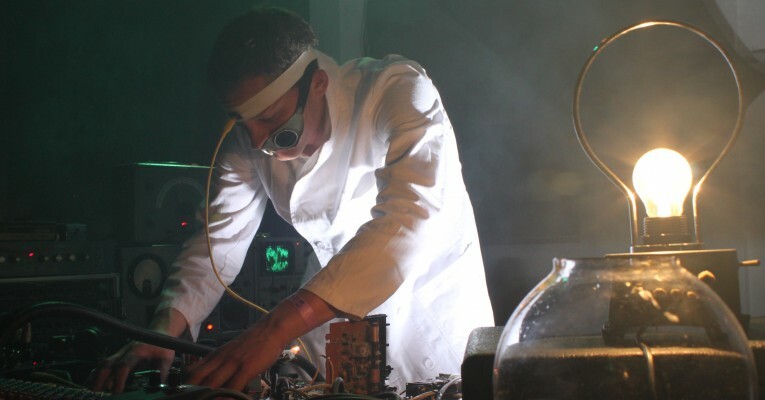 His work reflects an organical approach to the field of electronic music. In his compositions, performances and installations there is always an element of controlled chaos. He explores the relation between man and machine by conceiving the two of them together as hybrid systems in which erratic behaviour is the principal condition for interaction. Another common theme in his work is recycling. Like a modern Frankenstein, van Wersch constructs his machinery from parts of deceased equipment and disfunctional devices. – By short-circuiting electronic circuits and creating complex feedback networks a certain degree of unpredictability is achieved, obliging you to struggle with your instruments to stay in control, as if they had a will of their own. I consider this a step towards the creation of Artificial Intelligence. It is also an attempt to make electronic music in a more physical way, rather than just pushing some buttons.